Anyone that found Thelonious Monk to be too quirky and off centre should try listening to the music of Herbie Nichols. Another great unrecognised genius of jazz, he went his own way with his own musical style and method of interpretation to the end and sadly, as he died at the early age of 44, he remained an obscure figure for most jazz people. Duck Baker has selected nine of Nichols’ best known compositions and plays them here on acoustic guitar with no other accompaniment. The melodies are unique and different; as Duck Baker says in his liner notes: “Nichols voices his pieces with opaque clouds of gentle dissonance”. And as Duck also points out, Nichols’ music seems to deliberately embrace problems that most other composers instinctively avoid. It all makes for some unique, personal music. Baker is so obviously into it, with an understanding that Nichols would surely have appreciated. Although he plays with his own take on all of these compositions, Duck keeps to the expressive methods of delivery in performance that Nichols used. 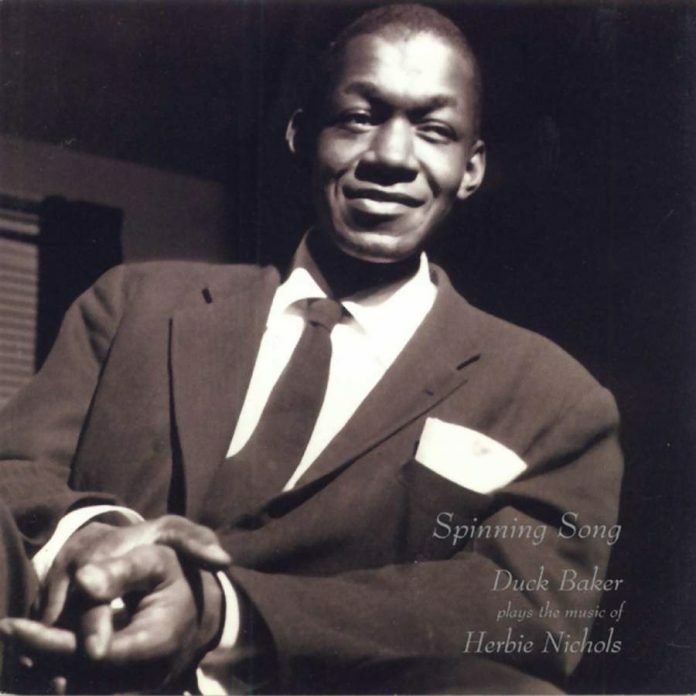 Check out “Spinning Song” with the original version by the Herbie Nichols Trio on Blue Note 1519 and the versions are similar in some respects although Baker’s version is slower and somehow, more intense. “Portrait of Ucha” is another example of Nichols’ music veering off into regions most others would avoid and here it is played with great sensitivity by Duck on a small miniature Mexican guitar “with built-in distortion”. The sound is certainly heavy and dissonant but somehow, crazily logical. Duck Baker playing these pieces on acoustic guitar in a gentle manner but bringing out all the subtle twists and turns of the composer’s intention is certainly something to savour. This is a personal but respectful take by the guitarist and it produces some fine, fresh music celebrating some old but under-appreciated work from the past. Nichols, like Monk and Sonny Clark, is far more appreciated and understood today than in his lifetime but with records like this his music can be spread more widely and seen for the fine body of work it was. It might even send some people back to those old Blue Note and Bethlehem trios. This release comes in pristine red vinyl and follows on from the original CD release back in 1996. Duck Baker (g). New Jersey, October 1995 – January 1996. "...some fine, fresh music celebrating some old but under-appreciated work from the past".